There’s a lot to this, so I’ve split the analysis up into two parts. This week we’ll look at the details of the crash and next week I’ll focus on the administrative issues that led to it. In the beginning of November, the British Air Accidents Investigation Branch released their bulletin concluding their field investigation on the fatal accident involving G-YAKB which crashed on the 8th of July, 2016. This accident had already had a detailed report as a result of the Service Inquiry, a military investigation, which was completed on the 25th of April, 2017. Both the AAIB and the Defence AIB needed to investigate this case because it involved the death of an RAF pilot in a civilian-registered aircraft. Surprisingly, most of the detail of this piece comes from the Service Inquiry rather than the AAIB report, which attempted to avoid the organisational and operational aspects which were the focus of the military inquiry. In this case, I found the statutory investigation extremely confusing and it wasn’t until I understood those aspects that I could make sense of how this happened. This case has as much to do with paperwork and admin and regulations as it has to do with flying so there’s a bit of explaining to do. I started out thinking it would be straight-forward but, well, not really. Nevertheless, I hope you’ll find it as interesting as I did as I unravelled all the details. G-YAKB was a Yakovlev Yak-52 (Яковлев Як-52): a Soviet all-metal two-seater aerobatic trainer introduced in the late 1970s for Soviet DOSAAF training (Volunteer Society for Cooperation with the Army, Aviation, and Fleet). Here’s a video of the aircraft taken in 2011, five years before the accident. G-YAKB was privately owned and had been contracted out for use in Qualitative Evaluation training offered at a test pilots’ school at Ministry of Defence (MOD) Boscombe Down, a military aircraft testing site in Wiltshire, England. We’ll look at this in more detail after the crash. The important point is that G-YAKB is privately owned. It was sourced and contracted by the pilot who was offering the Qualitative Evaluation in the Yak-52, who we will refer to as the commander as he was both the Pilot-In-Command and the operator for the purposes of the training flights. The commander held a current Flying Instructor rating and a Display Authorisation. He’d been flying a Yak-52 for the Qualitive Evaluation at Boscombe Down for the past 7 years. In the 1990s, many Yak-52s were exported to the west: there may be more in the US, UK and Australia now than there are left in Russia. The Yak-52 has many clear differences in design philosophy and cockpit system. The test pilots and engineers were unlikely to be familiar with the characteristics of the aircraft. The Yak-52 never received civil or military type certification in the UK, with many imports from the time operating on the Russian or Lithuanian register. In 2002, the British CAA required that YAKs in the UK be operated under a Permit to Fly and registered in the UK – as of January 2017, there were 40 YAK-52s on the UK register, including G-YAKB. The important point here is that G-YAKB did not have a Certificate of Airworthiness but instead a Permit to Fly. 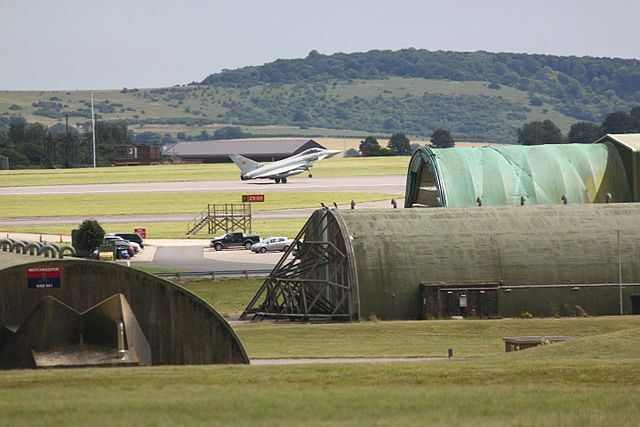 The commander contacted the owner of G-YAKB and entered into an agreement with him to use the aircraft for Qualitative Evaluation at Boscombe Down. He’d first flown a Yak-52 in 2005 and he had 446 hours on type. He had a total of 5,773 military flying hours and 518 civilian flying hours. The commander flew the Yak-52 to Boscombe Down on the 3rd of July, 2016. He was accompanied by an instructor from Empire Test Pilot School. Over the next few days, the commander flew sorties with each of the students. The student test pilots flew from the front seat while the commander sat in the backseat. The flight test engineer students sat in the back seat with the commander in the front seat. Each of the test pilot students experienced local area flying, aerobatics and two to three landings. Initially, the students were offered a hard-shell helmet for the flight. However, the quality of the intercom and radio transmissions was low and in order to improve communication, a headset was offered to the students. On the morning of the 8th of July, the commander was scheduled to fly two more Qualitative Evaluation sorties: the final test pilot student followed by an Empire Test Pilot School instructor. The instructors at the school were expected to fly at least one Qualitative Evaluation flight a year as a part of their continuous professional development. The student fell ill and the instructor was asked if he was happy to do the flight early. The instructor had not attended the mandatory Technical and Safety Briefing which the commander had taught at the beginning of the week. The commander and the instructor met in the planning room for a briefing, which took about 15 minutes. They then walked to the hangar, where they were observed as being ‘rushed’. They helped to push the Yak-52 out of the hangar and refuelled it. They didn’t replenish the engine oil. The weather was ‘Colour Code Green’ which means a cloud base of 700 feet or higher, with visibility 3.7km (2.3 miles) or higher. The instructor took the front seat (I will refer to him as the Front Seat Pilot from here on) and the commander was in the back seat. They departed from runway 23 for the one-hour sortie under Visual Flight Rules, operating to the west of Boscombe Down under a Traffic Service, which means that the controller provides ‘specific surveillance derived traffic information’ in addition ot the Basic Service (weather info and aerodrome information), to assist the pilot in avoiding other traffic. They climbed to 5,200 feet above mean sea level and performed a number of aerobatic manoeuvres between 3,400 feet and 5,200 feet, including inverted flight. The Front Seat Pilot (the instructor undergoing the Qualitative Evaluation training) handled the radio and presumably flew the manoeuvres. The aircraft was at 4,000 feet and in a slow descent when the engine lost power without warning. The propellor windmilled as the commander exercised the throttle, which had no effect. He scanned the instruments available to him in the back seat and saw that the fuel pressure indication was zero. He took control of the aircraft and attempted to release the valves through flying high-g turns. The commander told the Front Seat Pilot to turn the fuel primer handle to the left position and pump it, on the basis that the engine-driven fuel pump had failed. The commander’s recollection of the final minutes of the flight are hazy but he recalls that the Front Seat Pilot was pumping at a rate of once every 3 to 4 seconds. Each time he pumped, the engine started and accelerated briefly before stopping again. The fuel pressure increased with each pump of the primer. The engine sounded normal during the restart attempts and there were no additional noises that indicated a mechanical failure. The fuel pump appeared to be the problem. According to the manufacturer’s checklist for engine shut down during flight, the throttle level should be at ‘about one third of a stroke’ before pumping the primer handle in the left position. It then says: as soon as the engine starts running again, bring the throttle lever in take-off condition (full power) for 1-2 seconds. But the aircraft didn’t have a checklist — it didn’t need to as it was registered on a Permit to Fly. The commander’s checklist, recited from memory, didn’t have any reference to throttle movement. He exercised the throttle and then returned it to about 70% rpm. The commander has no recollection of putting on full power when the engine started and this was not a part of the checklist he’d committed to memory. The commander decided they should continue towards Boscombe Down, hoping that the engine would recover. The Front Seat Pilot continued to pump the primer handle. At around 09:30, an eyewitness saw an aircraft travelling east. He thought that the aircraft was around 1,000 to 1,500 feet above ground level, above some scattered low cloud. He remembers that the engine sounded like it was faltering and then died completely before restarting again for a period of four to five seconds. The engine faltered again and stopped, this time for good. The aircraft then went out of sight, blocked by the low clouds and some large trees. A PFL is a practice forced landing although there was nothing practised about this one. At this point, radar showed the aircraft at about 2,650 feet above ground level. The controller transmitted the surface wind for Boscombe Down (230° at 14 knots), which the Front Seat Pilot acknowledged. The rate of pumping the primer handle was clearly not enough to allow the aircraft to maintain height. The commander did not ask the Front Seat Pilot to pump faster. Although the Front Seat Pilot was an instructor for test pilots and well-qualified, the Qualitative Evaluation flight by definitioned need to be on an aircraft he was unfamiliar with. In fact, he knew less about the aircraft than any of his students: he had not attended the 90 minute briefing but instead had only a 15 minute briefing before getting into the plane. This seems a short time to cover the handling characteristics of the aircraft, the sortie planning, emergency procedures and, most importantly now that it had happened, the delegation of duties in case of an emergency. The aircraft did not have a checklist, so he was totally reliant on the commander’s memory and communication of the emergency procedures. The intercom audio had been reported as low quality and he had various instruments which were not trustworthy. However, his interactions were critical as some of the engine controls were only available in the front cockpit. Meanwhile, the commander was stuck in the back seat with limited visibility and reduced access to instruments and controls. He had three previous forced landings in the Yak-52 following engine failures, in each case landing the aircraft on a grass strip or an airfield with the landing gear extended. However, in every case, he’d been in the front seat. In fact, his front-seat students from that week seemed to recall that they’d done all the landings while he was in the backseat. He’d demonstrated Practice Forced Landings (PFLs) from the back seat when instructing but had never actually performed a forced landing from the rear of the plane. The forward visibility from the rear cockpit was ‘very poor’, in the words of the commander. He had briefed some of the Front Seat Pilots that in the event of a forced landing in a field, he may need to hand over control to them for the landing. However, he couldn’t remember if he’d said this to the instructor who was the Front Seat Pilot on the day of the crash. He also did not know who had control of the aircraft for the accident landing, although he said that if he had handed control to the Front Seat Pilot, he would have done so when the aircraft was straight on the final approach. He also confirmed that the rpm gauges in both cockpits were ‘intermittently serviceable’ during the training week. The aircraft continued to descend. The engine did not recover. Air Traffic Control informed the two pilots that the aircraft’s range from the airfield was 9 nm, which meant that they could not possibly reach Boscomb Down. However, there were a number of suitable fields available for a forced landing into wind. The commander committed to a forced landing at about 1,100 feet above ground level and travelling downwind, that is, with the wind behind them. The two pilots identified a large wheat field and established an approach to it. The manufacturer’s flight manual for the Yak-52 says that after an engine failure, the aircraft should be flown at 160km/hour (86 knots) with the landing gear and flaps retracted. A forced landing on rough or unknown ground should be carried out with the landing gear retracted (to keep the aircraft from tipping over on touchdown). After the accident, the commander said he would normally conduct an off-airfield PFL to a minimum height of 500 feet above ground level at a speed of 180 km/hr (97 knots). He felt that the faster glide gave him more flexibility. The Front Seat Pilot transmitted their intentions to ATC. Golf Kilo Bravo is may PFL’ing to a field just to the west of Boscombe. Er, will phone you on the ground. This was the last transmission received. The commander definitely kept control of the aircraft during the descent but he wasn’t sure who had control for the final approach. He also couldn’t remember whether the Front Seat Pilot continued pumping after they’d chosen the field for the landing. During the approach, an east-west farm strip came into view ahead and to the left of them. The commander has no recollection as to which of them made the statement or how he decided to try to land on the strip instead of the wheat field they had chosen. He also couldn’t remember which direction the aircraft turned or whether they were positioned to the north or the south of the strip. The only thing that is clear is that the pilots adjusted the flight path to align with the farm strip at the last minute. The aircraft was descending at 1,150 feet per minute. The wind direction doesn’t appear to have been taken into account at all — possibly the pilots’ workload was too high for them to consider the wind direction or they didn’t correctly recall the wind information given to them. Also, the heading indicator was unserviceable, which might have confused them. Certainly after the fact, the commander had no recollection of the wind at Boscombe Down and did not recall ATC transmitting the wind information after the Front Seat Pilot had declared an emergency. The result was that they attempted to land with the wind behind them. The time elapsed between the Front Seat Pilot transmitting that they were performing a forced landing to the point when the aircraft hit the ground was only one minute. The Yak-52 came down into the farmer’s field in a steep left bank next to the edge of the east/west landing strip. The left wingtip struck first. The nose struck the ground and then the aircraft bounced backwards, probably striking the tail, before bouncing forward again. The front of the fuselage broke up and the Front Seat Pilot was thrown clear of the aircraft. 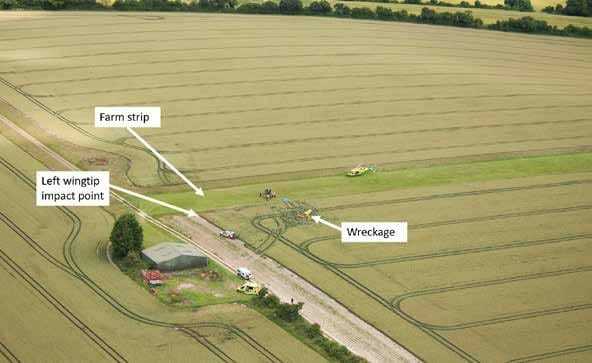 A Gazelle helicopter based at MOD Boscombe Down was operating in the area at the time of the accident. The helicopter captain heard the Front Seat Pilot’s transmission that they intended to put it down in a field and told ATC that they were free to offer assistance. The controller gave the helicopter the aircraft’s last known radar position. They saw the wreckage below and reported no sign of survivors before landing near the crash site. After landing, the helicopter captain found the Front Seat Pilot lying in the field about ten metres in front of the aircraft. He showed no signs of life. There was a landing strip, wasn’t there? The commander was still strapped in the seat of the rear cockpit. He was injured and confused. The helicopter captain heard him say, “There was a landing strip, wasn’t there?” When asked what happened, he explained that they came in steeply and he had to level off. The commander has no recollection of this conversation. An Augusta 109 was next on the scene. The two helicopter captains attempted first aid on the Yak-52 commander while the co-pilot of the Gazelle took off and hovered near by to attract the emergency services to the site of the crash, which wasn’t accessible by road. A third helicopter arrived from Boscombe Down, followed by two air ambulances and a Search and Rescue helicopter. The local police and Rescue and Fire Fighting Services and an ambulance arrived next. Attempts to resuscitate the Front Seat Pilot were abandoned; the man was pronounced dead at the scene. The Front Seat Pilot was wearing the headset which was being used to help with the intercom difficulties, rather than hard shell helmet which had been available to the students earlier in the week. Although it is clear that wearing the hard-shell helmet would have added protection and reduced the severity of the failure and head injuries, the RAF Centre of Aviation Medicine said it was difficult to determine whether wearing the hard-shell helmet with a visor would have reduced the injuries to the extent that the Front Seat Pilot might have survived the accident. 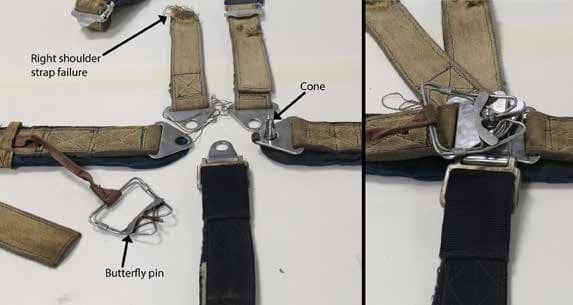 The seat harness lap straps appear to have been original to the aircraft. If so, they were 24 years old, four years older than permitted by the aircraft manufacturer. However, when the CAA granted a 20-year-lifetime extension to the Yak-52, they did not specify seat harnesses among the items that required replacement. The aircraft manufacturer could not prove the strength of the original straps but believed them to be in excess of 900kgf (kilogram-force). A Lithuanian company which maintains and overhauls Yak-52 aircraft carries replacement straps with a minimum break strength of 2,650 kgf. Military specifications for tensile breaking strength is 2,721 kgf. Tensile strength tests of the lap straps showed the right front seat lap strap had failed at 460 kgf and the left at 570 kgf. The shoulder straps were too short to be tested. The commander was extricated from the wreckage and the air ambulance took the commander to the Major Trauma Unit for medical care. He had fractures to his facial bones, bilateral fractures in his lower limbs, fractured pelvis, ribs and palm of his right hand. His left eye was seriously injured. The wreckage of the Yak-52 covered less than 33 metres. The fuselage, wings and tail were still intact but there was serious damage to the nose and the engine had been almost completely detached. The front landing gear lever was in the down position with the safety gate closed, with the rear landing gear lever in the neutral position. When the aircraft crashed, the landing gear was in transit. It’s likely that the landing gear lever was selected to down less than 15 seconds before impact. One of the two propeller blades had broken off at the root and been shattered into pieces. Both propeller blades had scratches consistent with rotation: the broken off blade had scratches at the top and the attached blade on the forward blade near the root. This means that the propeller was rotating at impact but had stopped almost immediately, so the engine was producing very little if any power. There was no mechanical damage found that would explain a loss of engine power. The magnetos still produced steady sparks at low and high rpm even after impact and the spark plugs were in satisfactory condition. Four distinct witness marks indicated the Exhibit 24 initial impact point of the aircraft and subsequent movement. The aircraft had impacted the ground left wing first travelling downwind in an easterly direction, rotated onto its nose and subsequently came to rest facing in a northerly direction amidst, and partially concealed by, standing crops. The surrounding crops at the fourth impact point were mostly undamaged and indicated a near vertical arrival at the final resting point. There was oil on the wreckage but no smell of fuel. The bulb filaments for the master switch caption was stretched, indicating that the master switch was probably on at impact. The bulb filament for the generator caption was also stretched, again indicating that the filament was hot at impact and so the light was on, in this case, be a warning that the generator was generating below normal output. The windmilling engine would normally be enough for sufficient generator output if the aircraft was at best glide speed, so it seems likely that the aircraft was at or near stalling speed. The aircraft was probably being manoeuvred at low speed in an attempt to reach the strip. The damage to the aircraft and the low distance travelled after initial impact also implies that the aircraft was at low speed. The left and right fuel lights imply that the fuel tanks each held 40-45 litres of fuel, which is in line with the actual powered flight of the aircraft after refuelling that morning. Thus at the time of the crash, the aircraft held about 83 litres of fuel. Fuel found in the collector tank was tested and found to be normal for AVGAS. The engine had suffered a complete loss of power but reportedly produced brief periods of power when the primer was pumped in the left position. The loss of power was reportedly accompanied by a loss of fuel pressure and pumping the primer in the left position caused the fuel pressure to increase. These symptoms are consistent with a fuel pump failure, but the fuel pump operated normally during a bench test and the fuel pump drive was intact. There were no disconnections in the fuel system, apart from breaks associated with impact forces. The non-return valves were tested with fuel and inspected; there was no evidence of the valves sticking that might have caused a loss of fuel pressure. All the filters in the fuel system were clear and no blockages in the fuel system were found. It’s possible that air had entered the fuel system during the aerobatics: apparently a Yak-52 fuel pump will stop pumping if sufficient air enters the system and this would explain the symptoms that the commander reported. Another possibility is that there was water in the fuel but, generally, this type of sudden loss of power happens shortly after take-off and that doesn’t explain why the commander saw the indicated fuel pressure drop. It’s also possible that the aircraft suffered from carburettor icing, although that usually manifests as a gradual loss of power and rough running, which is not what the commander described. Presuming that the fuel pump that failed, the manual pumping at about one stroke every 3-4 seconds would not produce sufficient power for level flight, even though they received brief bursts of power. Following an in-flight failure of the engine driven fuel pump the primer, set to CARB [left], may be used as an emergency fuel pump to maintain fuel pressure and thus enable the aircraft to be flown to the nearest diversion airfield. We often see crashes like this, where it seems like the pilots were cursed with bad luck. It’s natural to think about what should have been. If the problem was the fuel pump, it should have been possible to restart the engine. Even if they couldn’t restart the engine, two extremely competent pilots should have been able to put the aircraft down in the field. And even if somehow they failed to do this and stalled on final approach, it should have been possible for both pilots to survive the accident. Where was the checklist that should have been in the aircraft? What could explain that two pilots, both instructors, did not know the Yak-52 engine restart procedure? Why were the seatbelts allowed to deteriorate so badly that they couldn’t keep the Front Seat Pilot in place? How was it possible that the engine had never been overhauled, twenty-four years after the aircraft had been built? Next week, I’ll look at the paperwork and registration issues that allowed this to happen. Hmph, no strikeout tag? “complacency…shortcuts” was supposed to be struck out. A preview feature would help too. Although the blog allows for mark-up, the comments don’t, which is frustrating. It’s only recently that I managed to get them threaded! :D I’ll look into it though, you are right.